- Select "Portfolio -> Portfolio" from the menu. - Specify the starting capital then select the kind of portfolio you want to create. - Select "Automated Trading System" then click on "Next"
Make sure that the number of symbols does not exceed the maximum number of streaming symbols allowed by your broker or data feed. From the same form, you can update your trading system by clicking on "Click here to update" next to "Trading System". Here, we will define the time frame as well as the real-time data source. If we select "10m" (10 minutes) as time-frame then our strategy buy/sell rules will be executed each time a new 10-min bar is formed. If you want the strategy to execute on each tick, then all you have to do is select "Tick" as time frame. data feed (IEX, IQFeed, Barchart, Bloomberg, Reuters Xenith...). will be the same, however the last bar (most recent one) will update on each incoming tick. You can display these rules on a real time chart to have a visual confirmation of the changes. 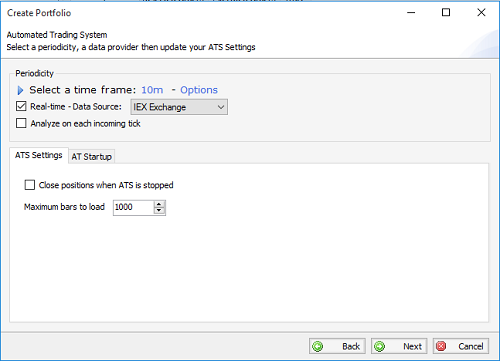 Here we will define the broker that the ATS will use when submitting orders. 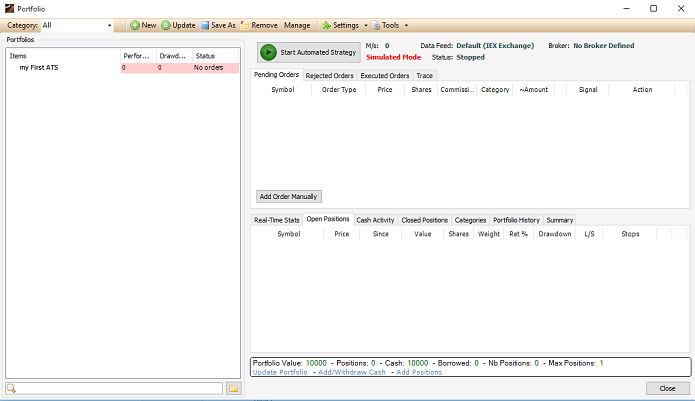 - Select the broker (Currently only Interactive Brokers is supported. IB must also be connected). Note: If the "Enable Simulated Mode" is disabled, close the Portfolio form, select "Accounts -> Real time settings", select the "Trading" tab then uncheck "Simulated Trading". - Click on "Finish" then name your automated trading system. To start the ATS, click on the "Start Automated Strategy" at the top on the right panel.